Des Moines, IA- The Iowa Barnstormers offense exploded in the second half, scoring six touchdowns to over take the Oklahoma City Yard Dawgz 68-60 infront of a crowd of 8,312 to land their first victory of the season. This leaves both teams with a record of 1-2. The Yard Dawgz came out scoring early with their first touchdown in the first five minutes of the game, but the Barnstormers continued to follow suite and return the favor. Larry Kendrick scored one of two defensive touchdowns of the night on a fumble recovery in the end zone. The Barnstormers went into halftime with the Yard Dawgz in the lead 31-27. The ‘Stormers came out firing in the second half, Jesse Schmidt was Quarterback Ryan Vena’s primary target throwing him two touchdown receptions while Vena carried in two touchdowns of his own. Linebacker Micah King scored the second defensive touchdown of the game on a fumble recovery for eight yards. The defense used the momentum of the offense in the second half as Defensive Back Tanner Varner made an impressive interception to help turn the game in the ‘Stormers favor. The Barnstormers held on to the lead they took over at the beginning of the fourth quarter to come out on top of the Yard Dawgz when the clock ran out with a score of 68-60. The Barnstormers head out on the road to Orlando next week to take on the Predators and then return home to Wellmark Field on May 8th to take on the Cleveland Gladiators at 7:05pm. 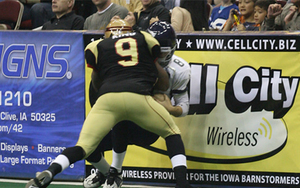 Get your tickets today by purchasing them at the Arena box office, online at www.theiowabarnstormers.com, or by calling 515-633-2255.